Freezing temperatures, scorching heat, and a storm bigger than planet Earth is just some of the wild weather you will encounter on your trip through our solar system! Get your fun facts along with your forecast for each major planet, as well as the weather on dwarf planet Pluto, and Saturn's moon Titan. 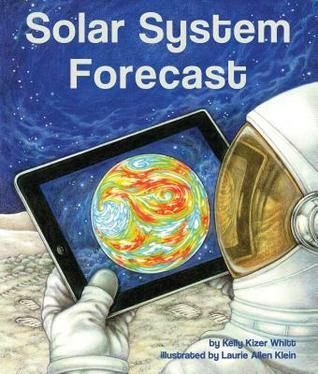 Any child with an interest in space is sure to love Solar System Forecast, and parents will love the educational “For Creative Minds” section in the back of the book. Get ready for some out of this world fun with Solar System Forecast! Firstly I loved this book because it still included Pluto as a planet! I know officially it has been demoted, but since I grew up with it as a planet I just can't replace that thought. I was excited to read this to the kids and find that they still had far off pluto. The weather on each planet is described and it really helps the kids get a feel for why earth is the only planet we can live on. The book was written in a very understandable way for kids ages 4-8 and a bit older. I know my 10 year old also really enjoyed this book and many of the teacher activities would be right up his alley. Beautiful illustrations help you to visualize what the planet and weather may really be like. Bright and colorful, Laurie Allen Klein has done a fantastic job with all of the details. Look at things like the atmosphere, the greenhouse effect, solar ovens, and much more! Be sure to check out Sylvan Dell Publishing for other great reads this summer!